For Mike, the day started out as any other, getting ready for work and going through his morning routine. And then it happened, something that changed everything. Now, on the run from an evil he can't begin to understand, will he find his way home to his family, or will he be swept away in the rising tide of insanity and the unknown? 5.0 out of 5 starsAnother home run for Mr. Catron! 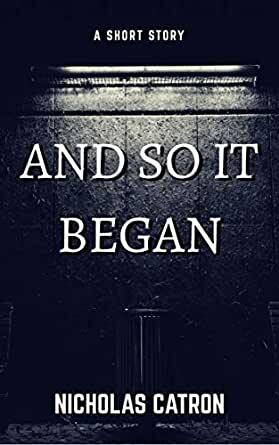 Just like with The Spaces Between, Nicholas Catron delivers another wonderful story here with And So It Began. The story has a dreamlike quality to it, a stylistic prose I cannot put my finger on, but it is so thoroughly enjoyable to read that I simply MUST mention it. Only here, it's a nightmare. 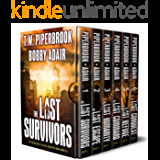 At once captivating, puzzling, intriguing, and terrifying, this tale of the dawn of the apocalypse hits all the right notes. The prose is liquid, the dialogue perfect, the characters surprisingly well-developed for such a short piece, and the final scene is an absolute gut-punch. This is a powerful story, and wholly unique despite its premise. This kind of tale hasn't been done in quite this way before, at least to my knowledge, and it drew me in with its singularity. Anyone who enjoys horror NEEDS to get this story. You do yourself a disservice in skipping, and it's well worth the meager price. It's worth three or four times this, perhaps more, and I honestly can't think of a crowd I WOULDN'T recommend this book to. Maybe blue-haired old ladies who like their books cozy and happy. But anyone else should love this one. Seriously, don't miss it. This one goes to eleven, and I'd give it that many stars if Amazon allowed me to. This was a good, fast-paced short story with plenty of action. I don't normally read short stories because I like to get to know the characters and that's not possible in a story that has only 40 or 50 pages. Although I'm not a grammar nazi, I always have an issue when people use the word seen instead of the word saw, as in "I seen them coming" and this author used seen incorrectly at least twice. It just grates on my nerves when anyone does it, and a writer should have a better grasp of the language. If not, then surely an editor should have picked it up. If not for that I would have probably given this short story a solid 5 stars, and I will look for more of his work. Wow! Talk about waking up on the wrong morning! This short story takes a quick turn into zombie hell before the sun even comes up on the work day. This isn't your typical story about mindless wondering zombies. I'm not even fully convinced zombies is the right word, just the closest I have. Really cool concept, fast paced and gory right to the very end. And So It Began by Nicholas Catron is a fast-paced short story about a guy who wakes up into an ongoing nightmare. Readers are never told what exactly is happening to the people around Mike, but it doesn't matter. The many fight and run-for-your-life scenes are intense and terrifying. I enjoyed this setting so much, I would read a similar story told from Tiana's POV. For being a short story, I found it to be well developed with great character interaction and an ending that will knock you for a loop. This one is well worth taking the few minutes to read during your lunch, or while waiting for the kiddo's.